Southern Serendipity: What Is Vulcanite? Upon the death of Queen Victoria’s husband, Prince Albert, black jewelry became the height of fashion as the queen chose to wear black the rest of her life. Consequently, black jewelry was fashioned from a wide variety of materials. One of those materials was Vulcanite. Often confused with a similar looking material, Gutta Percha, Vulcanite was actually the material usually chosen for making black jewelry. Vulcanite, made by combining the sap of Ficus trees from Malaysia with sulphur, was developed and patented in the 1840s. Though it can be various colors, the most popular became black, thanks to Queen Victoria who was an international trend-setter. Vulcanite (sometimes called Ebonite) can be confused with other substances such as Gutta Percha, Jet, French Jet, or Bog Oak. It helps to know that Vulcanite is a molded material with rounded edges, not carved with sharp edges like Jet or French Jet. It can be polished to have a sheen, but the finish will always be more matte than Jet. Bog Oak has growth lines since it is wood, but Vulcanite does not. 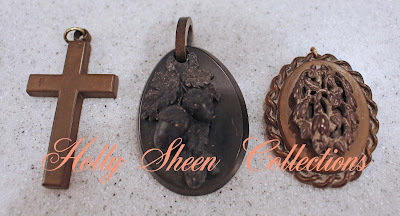 Victorian Vulcanite Lockets and Chains. 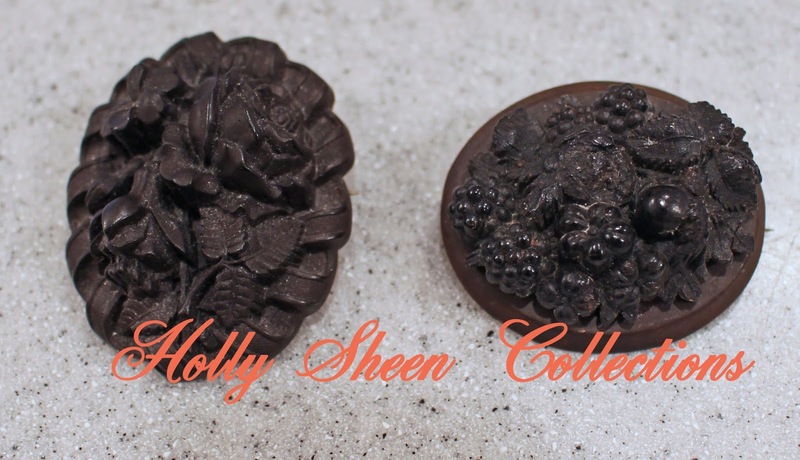 Holly Sheen Collections. Gutta Percha is also a molded material, but it was almost always used for making utilitarian household and commercial items such as boot soles and gussets, buttons, carriage belts, tubs, pails, cables, golf balls, etc. 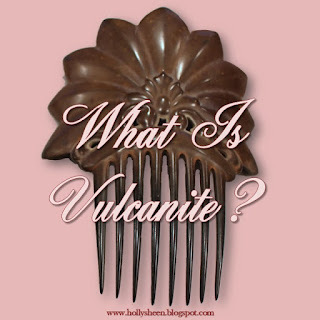 Vulcanite, on the other hand, was used for every imaginable type of jewelry - earrings, brooches, watch fobs, lockets, etc. Originally manufactured as black jewelry, over time Vulcanite can turn brown. Victorian Vulcanite Pendants. 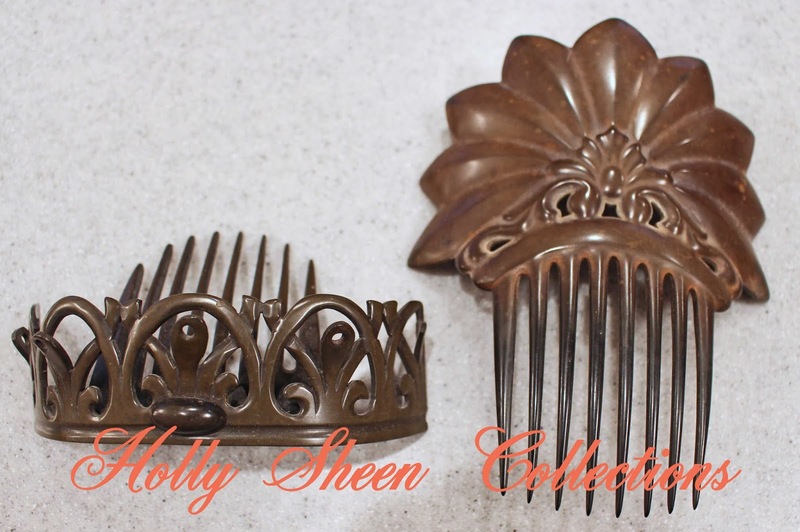 Holly Sheen Collections. Another way to try and identify whether or not the material is Vulcanite will be to rub the piece and if it is Vulcanite, it will smell like rubber. If all else fails, you can do a taste test. Yes, actually lick the piece! If the item tastes salty, it’s Gutta Percha. If not, it’s Vulcanite. If you don’t want to do the taste test, assume that the jewelry is Vulcanite and you’ll be right most of the time. Victorian Vulcanite Bracelet. Holly Sheen Collections. Victorian Vulcanite Brooches. Holly Sheen Collections. Victorian Vulcanite Hair Combs. 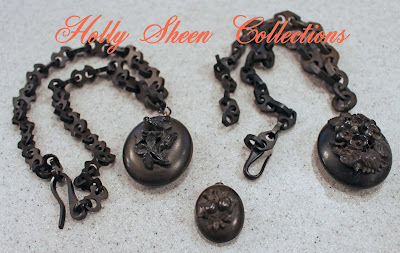 Holly Sheen Collections. And just for fun, here's a pair of earrings in my shop made with genuine vintage Vulcanite!